Twinned with the Panasonic HDC-TM10, the only way to tell these two HD camcorders apart is that the HDC-TM10 features 8GB of extra flash memory alongside its SD/SDHC slot. With only a £30 difference in pricing (at least on Amazon's UK store), the SD-only HDC-SD10 feels a little redundant. Given the choice, we'd opt for the slightly pricier TM10 every time. When you first clap your eyes on the Panasonic HDC-SD10, you'll want one. You'll look at your existing camcorder (providing you own one, that is) and wonder how Panasonic has squeezed so much technology into such a small and lightweight gadget. You might wonder why you didn't wait to buy one... Or whether you can afford to upgrade. Because the HDC-SD10 is guaranteed to turn heads. Like an Apache helicopter landing in a Tesco car park; or that moment when Susan Boyle first opened her mouth to sing on Britain's Got Talent. 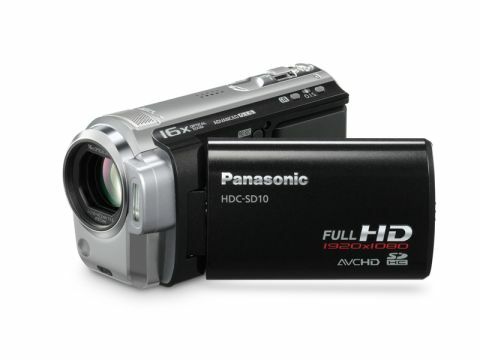 The HDC-SD10 is technically the 'little brother' to the Panasonic HDC-TM10. The main difference (bar a big splash of glossy black on the hinged LCD) is the lack of a dual storage system. But while the SD10 doesn't include the TM10's 8GB of internal flash storage, it still comes equipped with an SD slot for easy solid state recording. Panasonic should be applauded for providing an SD-only option. But when you consider that there's barely £30 between the price of the two models, the HDC-TM10 provides better all-round value. Don't believe me? Over on the Panasonic UK website, you can compare the two models side-by-side. As you'll see, they've got almost identical highlights – they weigh the same (227g without the battery), they both have a 1/ 6" MOS image sensor, 1920x1080 full HD resolution, a 16x optical zoom (plus 40x, 1000x digital zoom) and a 2.7-inch, touch-sensitive LCD. It's even more impressive when you consider that all this is somehow shoehorned into a compact 48x63x115mm (WxHxD) chassis.